Isomers are molecules which have the same chemical formula and sometimes the same kind of bonds but in which the atoms are arranged differently. Structural isomers have different atom-to-atom connections e.g. propanol (C3H8O or C3H7OH) has two isomers Propan-1-ol and Propan-2-ol. 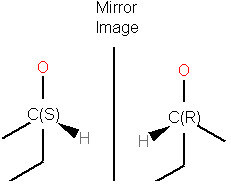 Diastereomers are not mirror images and have different internal dimensions (e.g. dihedral angles and distances between non-bonded atoms). They can be configurational diastereomers (which can be interconverted only by breaking bonds or by changing the configurations of stereocenters) or conformational diastereomers (which can be interconverted by rotation about bonds - including chair flips or by lone pair inversion . Enantiomers have identical internal dimensions, and are nonsuperimposable mirror images. Enantiomers can be configurational and conformational. Enatiomers are distinguished based on the Latin terms for left (sinister) and right (rectus). In some cases where the handedness is unknown a chiral center can be labeled "RS"or unknown. To enumerate and display in a separate table the stereoisomers of selected compounds. 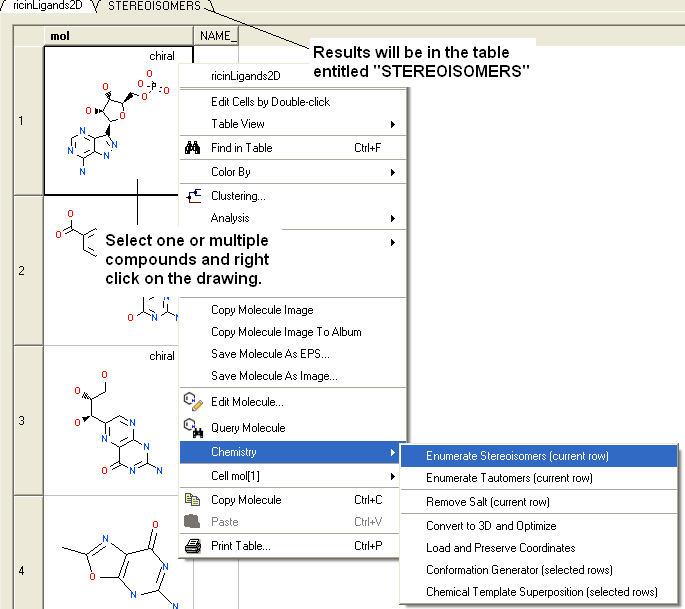 Right click in the table and select the option Chemistry/ Enumerate stereoisomers. Or select the Chemistry menu and choose Generate Stereoisomers. 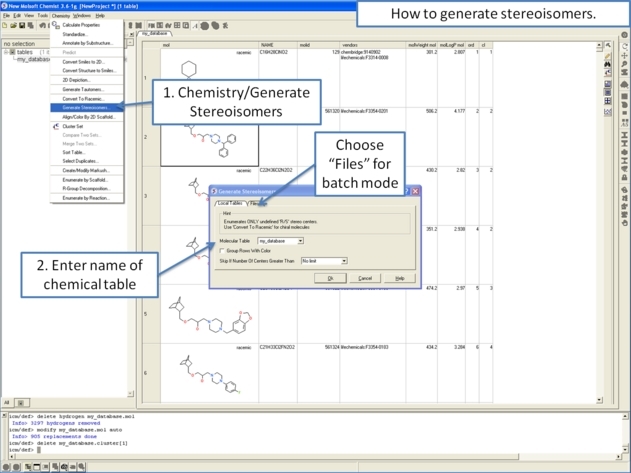 If you generate stereoisomers via the Chemistry menu you will get a dialog box whereby you can run the process in batch mode. There is also an option to color stereoisomers from the same compound with the same color. Group Rows With Color option will color stereoisomers from the same compound with the same color to visually higlight them. Skip if Number of Centers Greater than option can be used to filter out compounds which have a defined number of stereo centers. If you do not wish to filter just use the default No limit option. The compounds will be displayed in a separate molecular table called STEREOISOMERS. NOTE: Stereoisomer generation will keep pre-defined stereo centers and only enumerate racemic ones. NOTE: Only centers with unknown chirality will be enumerated.